On Friday, the Dow Jones fell 665.75 points. Or, if you round it, 666 points. Also known to many as the “mark of the beast”. It was also the sixth worst point drop in US stock market history. This also happened on the 33rd day of the year. 33 is the most important number in Freemasonry. This is noteworthy because it is the first serious drop in the US stock markets on a weekly basis in two years. But are the numbers 666 and 33 just a coincidence? I’ve long stopped believing in coincidences when it comes to the financial, monetary, banking and political systems. After all, the last major crash occurred on the very end day of the every 7-year Shemitah, September 29, 2008, when the Dow dropped 777.7 points. I wrote an entire book on how the elites orchestrate things to certain numbers and dates called, “Shemitah Trends, A Second Edition: The Plot to Enslave Humanity and How to Find Freedom” (free to TDV subscribers) where I went into detail about how it all works. In any case, the more important question is what does this very obvious signal from the cabal tell us? 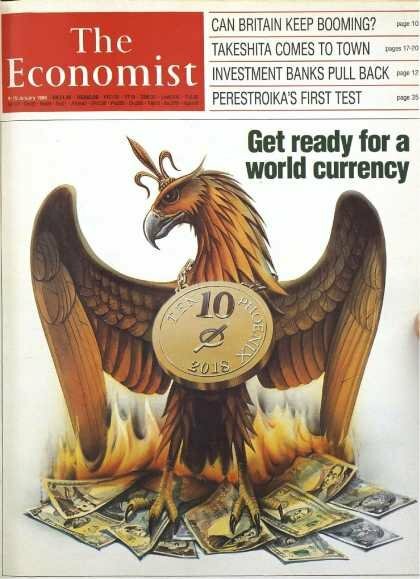 I wrote in the last issue of The Dollar Vigilante newsletter a further analysis of this 1988 Rothschild owned Economist cover forewarning to “Get Ready For A New World Currency” in 2018. I also said in the December newsletter that I expected something to occur at the start of the year which would tip us off as to what plans are in motion. And I think we got that on Friday. Cryptocurrencies fell more than 50% from their peak a month ago hitting a market capitalization of $348 billion on Friday and have rebounded somewhat since. This has led all the globalist talking heads to come out of the woodwork to say “I told you so”. 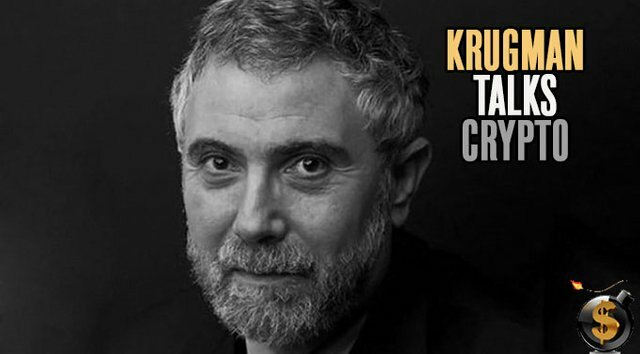 Like, “Nobel laureate”, insane globalist shill, Paul “let’s make a trillion dollar coin to pay off debt” and “fake an alien invasion to boost the economy” Krugman. What Paul doesn’t get because he has no idea what the market is except something to be squashed by communism is that this is a very healthy and needed pullback so far. Bitcoin, for example, is now trading at where it was trading on November 26th less than two months ago. One year ago today bitcoin was trading at $1,000. So, it has risen 800% in the last year. Doesn’t seem so bad. How about Ethereum? One year ago today it was trading at $11. It currently sits near $1,000 for a 9,000% gain in the last year. Boy, this crash is brutal! But, again, Paul Krugman wouldn’t know a market if it were to come right up and punch him in his disheveled, google eyed face so he is somehow taking glee from this. When he looks at numbers, charts and percentage gains it’s like a cat looking at a carburetor. It makes no sense to him… and all he knows is he wants the boot of the state to smash it. What do you expect though, he looks like some homeless man who lives in a van down by the river. 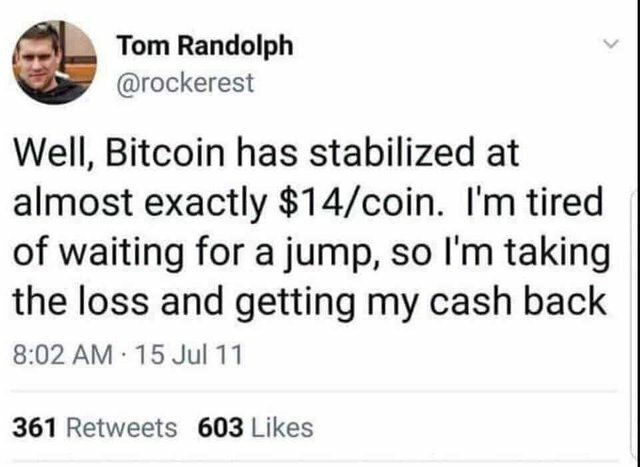 “Crashes” like these have happened since bitcoin’s inception. Good job Tom! Get that fiat trash! All that said, however, there are a lot of very serious issues going on in cryptoland currently. The Dollar Vigilante just put out an alert to subscribers this evening (subscribe HERE to gain access immediately) where I laid out many of the serious situations currently in play. I’ve been admonishing TDV subscribers to take profits for the last two months including on the last issue of TDV which just went out last week so many of us are actually quite “cashed up”, like Tom was back in 2011 but with better timing, and prepared to redeploy capital. But, not just yet. You can read why in our latest alert HERE. In the meantime, Friday’s 666 point drop on the Dow was quite likely a signal from the grand masters that things are about to go into play. TDV’s Senior Analyst, Ed Bugos, also outlined the current situation and how to profit from it in our latest alert. Stick with us here at TDV. 2018 is off to a rocking start and I expect it to get much crazier soon. 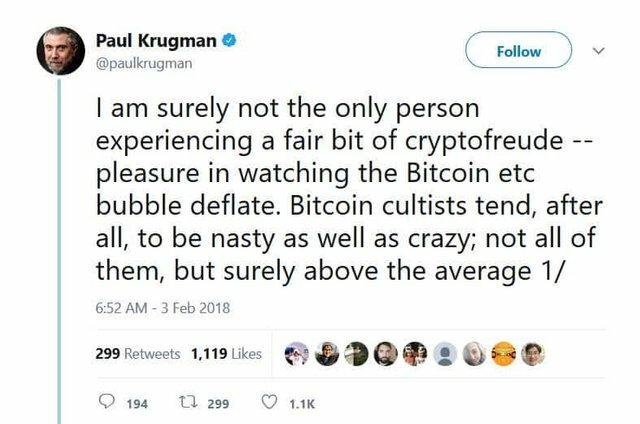 Or, be one of the 15 people left who still subscribe to the New York Times and listen to Paul Krugman and clap with glee that you were right about this crypto bubble because Ethereum is only up 9,000% in the last year. Go polish your fake Nobel prize, Paul. Rising oil price, falling USD and stock market ATH are ingredients for a perfect storm. When I see a double top on the Dow Jones chart I will open a leveraged short position (will be my first dept in years LOL). Agreed! I have a theory that the media and commentators are focusing their efforts on the crypto rise so that they can keep focus off of the bubbles in their traditional markets like stocks, debt, and derivatives. However, their markets are in the hundreds of trillions of dollars in market cap vs the $500 billion in cryptos that are trying to bring value back to people and the community by way of more transparent and decentralized technology. So how is everyone coping with this global recession, given that there is no end in sight? Great post, I’m sure @dollarvigilante reads his replies, he’ll like yours! Berwick’s posts like the above is why I started following him, not all all all of his bcc rants. Resteemed and today every cryptocurrency i care for was high in the green! Ps F#ck Ripple! Those numbers definitely aren't a coincidence! When I saw $666 on the 33rd day all I could envision was the Elite sitting in a lodge contemplating the next wave of control. There's something heavy brewing within the chambers of the powers that be in my opinion and seemingly some weird price manipulation going on with the stock market whales. Nonetheless the crypto community took a massive blow for sure, hopefully it will recover soon. My predictions are mid March top of April before we see some nice all time highs again. The market is being controlled by aristocrats. I won't be surprised if after a month Bitcoin in particular triples to $ 30k USD. They have the major investment, they control the market and regulate every sector of it. We are merely observers. 6th worst. Holy crap. That is a lot! look at the future with certainty, success always for you .. Jezeus...The Cabal is more fun than a barrel full of monkeys! FWIW: I think the one world currency is a red herring! IMO, it's about tracking every transaction, ​everywhere,​ by everyone, so as to attain a cut of the vig...They don't need a world currency to do that. reconnecting with the people of different societies.. The apocalypse is coming, lol. Why not exactly 666 for the second crash? If they're able to hit 777.7 surely they could have hit 666.0! You always post with Bitcoin.I think that,its really needed and helpfull for every steemians friend. thank you very much for your good post.dear@dollarvigilante.. Wonderful information on the people' s view about bitcoin.but friends , can i tell you something ,this battle we must surely going to win and life last . Hold on, where can I get these Phoenixcoins?!? Seriously I don't understand the cryptocurrency game, it's like puzzle to me? 🤔 anyway I wish great luck for those people who invest on it. After a slide like that on a Friday, probably related to memo hype, I would expect a really good day on Monday, as long as the Patriots win. Good points and no surprise if our world owners orchestrate these crashes. I'm just going to keep holding my crypto and see what happens.